Ruaha is several hours drive North from Mbeya but well worth the trip. It covers over 13,000 square kilometers and is Tanzania's second largest park. The life-blood of the park is the Great Ruaha River which follows the eastern boundary of the park, whilst the seasonal Mwagusi River also provides excellent game viewing during the wetter months. 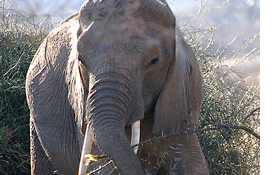 The Park's elephant population is reckoned to be around 10,000 - the largest of any East African National Park. Ruaha also supports healthy populations of water buffalo, zebra, kudu, hippo and crocodile, plus around 450 species of birds. Predators including leopard, cheetah, lion and hyena are commonly spotted on the open savannah. Few parks in African can combine such rich game viewing opportunities with the sense of peace and solitude that can be experienced in Ruaha. There are a range of accommodation options in the park including a lodge, tented camps and less expensive campsites.